Treat Bake Shop Founder Sarah Marx Feldner and Quince and Apple Co-Founders and Owners Matt and Clare Stoner Fehsenfeld announced today that their businesses are joining forces. Quince and Apple has purchased Treat Bake Shop and production of Treat’s spiced and candied nuts will move to Quince and Apple’s Madison kitchen in mid-March. Madison, WI, February 27, 2018 --(PR.com)-- Treat Bake Shop Founder Sarah Marx Feldner and Quince and Apple Co-Founders and Owners Matt and Clare Stoner Fehsenfeld announced today that their businesses are joining forces. 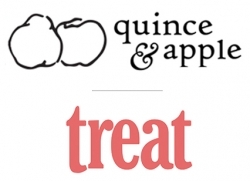 Quince and Apple has purchased Treat Bake Shop and production of Treat’s spiced and candied nuts will move to Quince and Apple’s Madison kitchen in mid-March. "I am incredibly proud of the Treat brand I have built and very excited for Quince and Apple's ability to extend its reach even further,” said founder Sarah Marx Feldner. “I have a ton of respect for Matt and Clare and I couldn't think of a better place for Treat to flourish." Quince and Apple, which was founded by Matt and Clare in 2009, has expanded beyond its Midwest base to grow its national profile and sales over the past several years by patiently building a trusted network of distributors, brokers and accounts that value high-end, artisan products. “We are excited to be able to use the resources we’ve built to introduce Treat Bake Shop’s spiced and candied nuts to a wider national audience,” said Matt Stoner Fehsenfeld. This represents the first acquisition by Quince and Apple in their nine-year history, but Clare Stoner Fehsenfeld says she hopes it’s just the first of many. Quince and Apple is a Madison, WI based artisan food producer that makes award-winning preserves and drink syrups. Founded in 2009 by husband and wife Matt and Clare Stoner Fehsenfeld, the company makes all of its products by hand in small batches. They maintain their own production kitchen in downtown Madison and ship products directly from the facility to stores and distributors nationwide. Treat Bake Shop is an artisan producer of spiced and candied nuts, including pecans, almonds and walnuts. Founded in Milwaukee, WI in 2011 by Sarah Marx Feldner, the company focuses on sourcing the highest-quality ingredients to produce unforgettable products with exceptional customer service. Their products are sold in specialty and high-end cheese stores across the country.